We greatly appreciate all the reporters, writers, and important figures for the mentions. Recognized BTS and the efforts of all US ARMYs for topping the Billboard 200 for the second time. 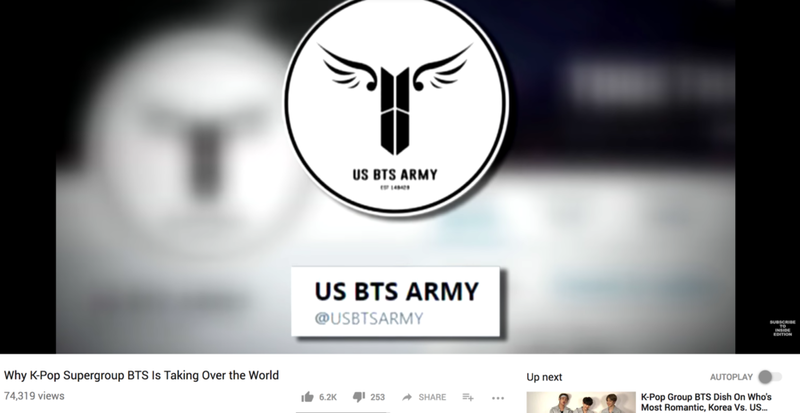 On a new segment, Sondy and Stina “Open the Pit” with admins from “US BTS ARMY” to find out all about what goes into running a successful fanbase, as well as the group that connects it all together–BTS. South Korean artists BTS have achieved unprecedented global success this year, thanks in part to their extremely dedicated and organized fanbase, called ARMY. MTV News talks to BTS fans about what the K-pop group's music and message means to them, and how it inspires fans to give back to their communities. Special thanks to MTV News for this wonderful coverage of our fandom! Briefly discussed about BTS’ growth from 2013, the difference between 90s US boy bands & BTS, and how US BTS ARMY started. Thank you for having us Kevan, we had a wonderful chat with you! Just for fun but thank you Billboard for that mini shoutout with our tweet! Thank you to reporter Lee Hyein of KyungHyang Shinmun for the interview. Thank you Jeff Benjamin for the shoutout! BTS dropped their new mini-album "Love Yourself: Her" along with title track "DNA," so we had to get one of the main administrators of the US BTS ARMY Twitter account back on the podcast! In this episode, Julia and her guest get into what it is like to run a K-Pop fan account, ARMY's campaign against re-uploading the "DNA" music video, and which members stood out the most in the video as well! In the 23nd episode of of KultScene’s K-pop Unmuted, Alexis Hodoyan, Tamar Herman, and the admin of US BTS ARMY discuss BTS’ latest album, Love Yourself: Her, their favorite songs on it, and what they think of the boy band’s ascent in the international market. On this episode of Fomo After Dark, Julia and the admin of the US BTS ARMY Twitter account were able to discuss BTS over the phone. In their conversation, they talk about why BTS stands out from other groups, not having a bias, and ARMY plans for helping to break BTS into the Billboard Hot 100! Thank you to My Music Taste for featuring us as part of your fanclub spotlight!